Kefalonia passenger and car ferry ticket prices, timetables, ticket reservations and information for ferries sailing from Kefalonia to Brindisi, Argostoli, Killini, Lixuria and Poros. Compare all available Kefalonia ferry ticket prices in real time and book the cheapest available Kefalonia car and passenger ferry tickets sailing to and from Cefalonia, Brindisi, Argostoli, Killini, Lixuria and Poros with Endeavor Ferry Lines or Ionian Ferries ferries online with instant confirmation. Book Kefalonia Ferry Tickets with Endeavor Ferry Lines or Ionian Ferries for ferries sailing from Kefalonia to Brindisi, Argostoli, Killini, Lixuria and Poros online in advance to enjoy the cheapest available ferry ticket price. The price you see is the price you pay. There are no hidden extras or surprises such as added fuel surcharges or booking fees and we do not charge you anything extra for paying with a Visa Electron card. The price we quote you for your selected Kefalonia passenger or car ferry ticket, onboard accommodation and vehicle type is all you will pay, and that's a promise. To obtain a Kefalonia ferry ticket price and book your ferry ticket securely online please use the real time ferry booking form on the left. You are also able to add a hotel at your destination, or anywhere else, to your ferry ticket when completing your ferry ticket reservation. Kefalonia is definitely one of the most popular destinations in Greece and it is considered as the most spectacular landscapes in Greece. Daily ferries connect the harbour of Patras, in the centre of Greece, to Sami, 22 km to the east of Argostoli, and the trip takes about 2 hours and 30 minutes. There are also ferries from Killini, on the western Pelopenessian coast, to Argostoli (4 hours), Poros (1 hour and 30 minutes) and Lixuri (2 hours and 30 minutes). There aren't ferries to connect directly Kefalonia to Piraeus but Kefalonia ferries also offer regular connections to Patras, Ithaca and Corfu as well as to some harbours of Italy (Venice, Ancona, Bari, Brindisi). There are also ferries between Zakynthos and Kefalonia. Ferries from Kefalonia leave from Pessada, on the southern side of Kefalonia, and ferries from Zakynthos leave from Agios Nikolaos Schinari, on the northern side of the island. The trip lasts about 1 hour and 20 min. Kefalonia is the largest of the Ionian Islands and covers an area of 781sq km, has a coastline of 253km and about 45,000 inhabitants. Kefalonia is situated between the islands of Lefkada on the north and Zakynthos on the south. It is in distance of 52 nautical miles from Patras and 22,5 from Kyllini. It is a part of Kefalonia and Ithaki Prefecture with nine municipalities, eight on the island of Kefalonia and one is Ithaki a separate island. The Prefecture of Kefalonia also includes the islands of Kastos and Kalamos. Kefalonia is named after its shape meaning ‘island with a head’ after the Greek word for head ‘kefali’. The capital of the island and also a port is Argostoli home to one third of the island’s inhabitants. There are three more harbours on the island Sami, Poros and Lixouri. Kefalonia is mountainous with highest Mount Ainos (1629m) and Paliki mountains to the northwest. Mount Ainos has been declared a National Park because is the only mountain in the Mediterrenean to posses a unique fir forest species called Abies Kefallia and inside the park the wild horses of Ainos can be seen. Touring around the island there are many picturesque villages such as Fiscardo a traditional settlement with beautiful neoclassic buildings, Assos one of the most scenic villages, Sami the second busyiest port with many archaeological findings and many others. Kefalonia is characterised by a landscape of astonishing natural beauty with tall forested mountains interchanging with rocky hills, valleys that as they reach out to the sea are transformed into fertile plains and golden beaches, amazing lakes and rivers and natural caves, the impressive sinkholes. Kefalonia is definitely one of the most popular holiday destinations in Greece not only because of the amazing landscapes but also for the friendly noble inhabitants characterised by their unquiet spirit and soul. Many notable people were born in Kefalonia such as: Juan De Fuka (Ioannis Fokas) captain and explorer (1536-1602), Nikos Kavadias (1910-1975) author and poet, Andreas Gerasimos Michalitsianos (1947-1997) Greek-American astronomer and NASA astrophysicist, Dionysis Zakynthinos the greatest Greek Byzantinologist, Gerasimos Sklavos the greatest Greek sculptor of the 20th century, Panagiotis Kavvadias the father of the Greek archaeology and many others. Best Price Guarantee - We always offer you our lowest available Endeavor Ferry Lines or Ionian Ferries passenger and car ferries ticket price to and from Cefalonia. There are no hidden extras or surprises such as added fuel surcharges or booking fees and we also we do not charge you anything extra for paying with a Visa Electron card. The price we quote for your selected Kefalonia ferry ticket, onboard accommodation and vehicle type is all you will pay, and that's a promise! In the unlikely event you find the same all inclusive Kefalonia ferry ticket cheaper in the brochure of any other tour operator we promise that we will do our best to beat that price or offer you the choice of requesting a refund. 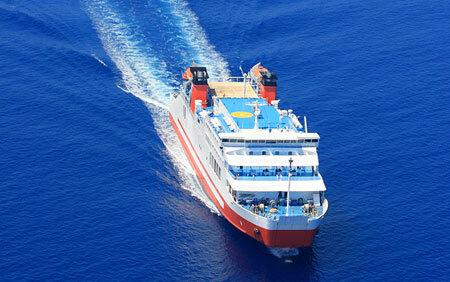 To book Kefalonia car and passenger ferry tickets please click here. At ferryto.co.uk you are able to obtain live Kefalonia ferry ticket prices, check availability and book car and passenger ferry tickets to and from Kefalonia at our lowest available ticket price. Ferryto.co.uk is part of the world's largest online ferry ticket distribution network providing the ability to book over 80 major European ferry operators including to Kefalonia and to over 1,200 other ferry routes throughout the UK, France, Spain, Ireland, Holland, Eastern Europe, the Mediterranean, the Baltic and North Africa.